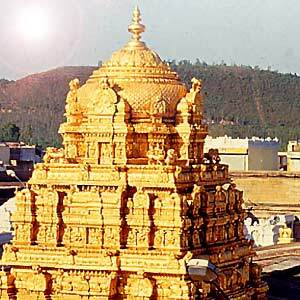 Tirumala Venkateswara Temple is a Hindu temple in the hill town of Tirumala, near Tirupati in the Chittoor district of Andhra Pradesh, earlier Tamil Nadu South India. It is around 150 km (93 mi) from Chennai, 500 km (310 mi) from Hyderabad, and 250 km (160 mi) from Bangalore. 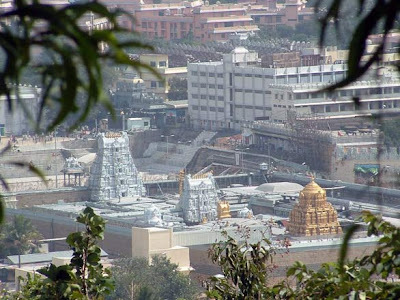 The Tirumala Hill is 853m above sea level and is about 10.33 square miles (27 km2) in area. It comprises seven peaks, representing the seven heads of Adisesha, thus earning the name Seshachalam. The seven peaks are called Seshadri, Neeladri, Garudadri, Anjanadri, Vrushabadri, Narayanadri, and Venkatadri. The temple is on Venkatadri (also known as Venkatachala or Venkata Hill), the seventh peak, and is also known as the "Temple of Seven Hills" , The presiding deity of the temple is Lord Venkateswara, a form of the Hindu god Vishnu. 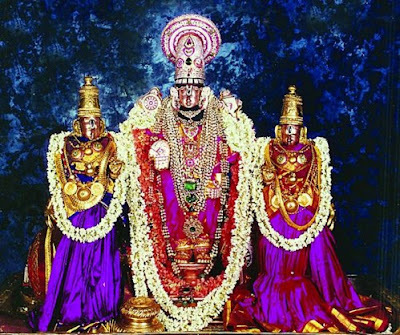 Venkateswara is known by other names: Balaji, Govinda, and Srinivasa. The temple lies on the southern banks of Sri Swami Pushkarini, a holy water tank. The temple complex comprises a traditional temple building, with a number of modern queue and pilgrim lodging sites. The temple is the richest pilgrimage center, after the Sree Padmanabhaswamy Temple in Thiruvananthapuram, Kerala, of any faith (at more than INR 50,000 crore) and the most-visited place of worship in the world. 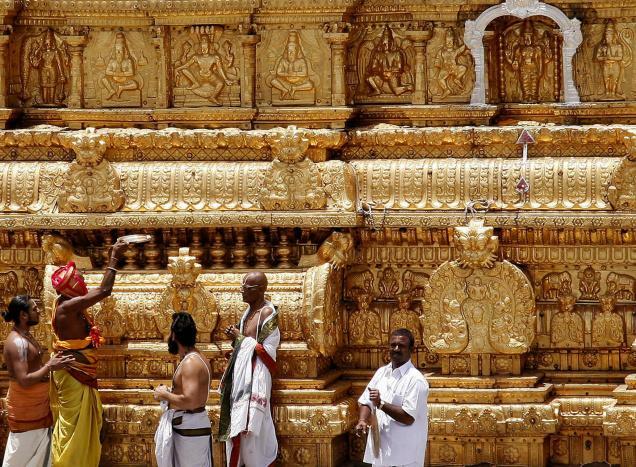 The temple is visited by about 50,000 to 100,000 pilgrims daily (30 to 40 million people annually on average), while on special occasions and festivals, like the annual Brahmotsavam, the number of pilgrims shoots up to 500,000, making it the most-visited holy place in the world. There are several legends associated with the manifestation of the Lord in Tirumala. 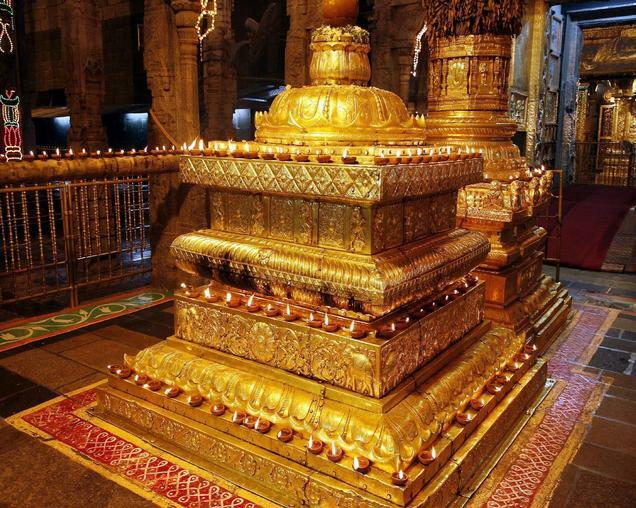 According to one legend, the temple has a murti (deity) of Lord Venkateswara, which it is believed shall remain here for the entire duration of the present Kali Yuga. 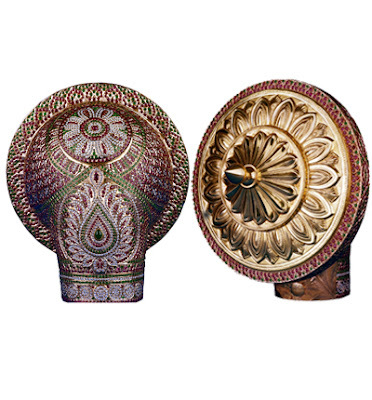 Tirumala has remained a highly frequented pilgrimage site in Tamilakam throughout most of its history and was a principle temple in the country of Tondai Nadu before the territory was transferred to Andhra Pradesh in the 20th century CE. Almost all the epigraphs of the temple are in Tamil and interspersed with Grantha characters. In the Dvapara Yuga, the hill was known by the name of Sheshachala or Sheshadri. The place was known as Venkatachala for centuries; it is believed that this name was given by Lord Brahma. Ancient Tamil literary works Silappatikaram and Manimekalai refer to this place as Thiruvengadam. "Ven" means "sin" and "Kata" means "destroyed or burnt". Therefore the name means that a person who worships there will get cleansed of all sins.